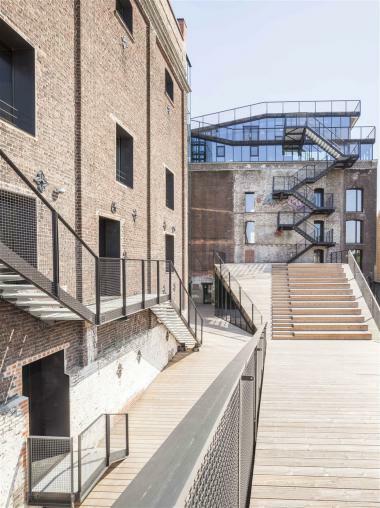 2016-10-03 – Today saw the opening of COOP, following the comprehensive conversion of the former Moulart industrial mill at 23 Quai Demets in Anderlecht into a business and cultural centre as part of the Port Sud project. The 5,099 m² site by the Canal offers a unique blend of functions in this fast-changing neighbourhood, working closely with the population. COOP, which is open to all, is both a workplace and a centre of learning. COOP Enterprise will offer premises and support to some twenty SMEs in more than 3,000 m² of work space: furnished and equipped offices, workshops and warehouses measuring 30 and 150 m². Even before the site’s official opening, Prométhéa (corporate sponsorship in the fields of culture and heritage) and Scarfilm (audiovisual production) had decided to take up premises there. The COOP Discoveries exhibition and workshops offer a cultural and educational programme focusing on the Canal, its industrial, social, cultural and economic life, its people and its associated environment. The permanent exhibition, divided into 14 thematic stations, looks at different facets of the Canal, its history, its people and its environment. 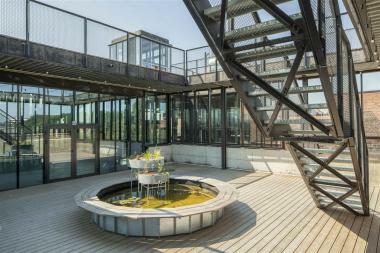 The ecosystem, flora and fauna of the Canal and the Senne are presented on the top floor of COOP; a marsh has been re-created for the occasion. Outside, an educational garden features a plant collection and an urban vegetable garden. A Waterway Innovation Yard is dedicated to boat building and renovation, woodwork and boat handling courses. The 5th floor and roof of the building are home to the Auditorium, which seats up to 70 people, and the 110 m² Café COOP, offering direct access to the panoramic terraces. Run by the Euclides business centre management team, COOP is the fruit of a partnership between public and private actors: CityDev, Abattoir, the Port of Brussels and the Municipality of Anderlecht. 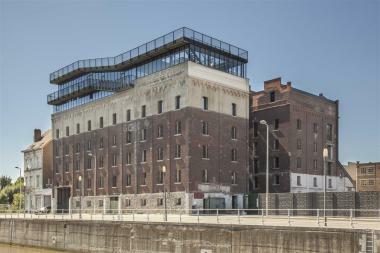 To make the Port Sud – Coop project feasible as part of the ERDF 2016-2013 programme, citydev.brussels and the municipality joined forces to acquire the building in late 2009 (1,850,000 euros). They then assigned it to the Moulart Cooperative via a long lease (for 40 years), in June 2010. A total of 7,992,520 euros has been invested by the Brussels Region and the European Union via the ERDF programme in the renovation of the site, the design of the discovery centre and the infrastructure. COOP is a place for encounters and synergies between economic actors, SMEs and visitors to the discovery centre. Partnerships are also being developed with schools, neighbourhood associations, cultural, environmental and heritage operators and others. COOP is organising an open day on Wednesday 9 November 2016 between 10 am and 5 pm.